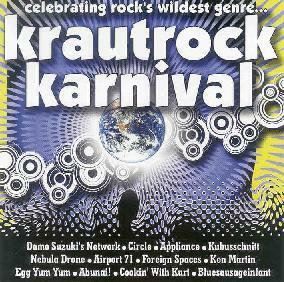 Various Artists - "Krautrock Karnival"
Now here's a tasty compilation put together by the folks at Krautrocknet.com, inspired after organizing the Krautrock Karnival festival in Exeter last June. The CD brings together a collection of bands that, intentionally or not, are inspired by the legacy of the German Kosmiche pioneers that came to be known as "Krautrock". The best thing about this compilation is that of the 12 entries only 4 were known to me so I had 8 new bands to wrap my thirsty ears around. The artists I was familiar with were Circle, Cookin' With Kurt, Abunai! and Damo Suzuki (who the hell doesn't know Damo?!!!). From Finland, Circle is one of the best Kraut/Space/Trance bands on the current scene, and a band that AI readers probably all know, given that we've written about them more than most bands. Their entry, "Dedofiktion", is an intense 8 minute jam from their Prospekt CD released in 2000. From San Francisco, Cookin' With Kurt is one Kurt Stenzel, who first came to my attention as a member of Beyond-O-Matic. But on this solo outing Kurt cranks out some excellent jazzy tripped out and highly spaced Krautrock. Also from the US, Abunai! were an excellent band who have regrettably disbanded, but were equally adept at pop-psych songs and cosmic jamming instrumentals like their "Earth Mover" entry to this set. Absolutely mind blowing space rock! And Damo Suzuki is, of course, one of the pioneers of the music this collection pays tribute to. Damo has been highly active in recent years and seems to tour non-stop. His contribution is an excellent spaced out song called "Cinderella Manager". Dig that freakout segment at the end. And then there was a cluster (no pun intended) of bands that were new to me. From California, Airport 71's "Traffic Control" is a quirky but heavy driving slab of electronic driven space rock. Kind of makes me think of a heavier rocking version of Neu. I'd like to hear more from these guys. UK based Appliance is an interesting band whose entry consists of laid back rock music with a trippy edge. Also from the UK is Ken Martin, who plays electronic space music tapped directly into the Tangerine Dream/Klaus Schulze vein. Very very nice. Germany's Foreign Spaces is from the same school but their style to my ears is more melodic progressive rock than Krautrock. Kubusschnitt is a VERY cool multi-national space band whose members are from Holland, Belgium, Germany and the UK. More excellent music from the TD/Schulze school. From Arizona, Bluesausageinfant's contribution was one of my favorites of the set, consisting of highly intense and totally freaked out space electronic mayhem. But the heaviest band of the set is UK based Egg Yum Yum. Rock out! These guys play heavy acidic space rock kicking out a pounding jam and lots of fun freaky cosmic sounds. I would love to hear more from these guys. And finally, Nebula Drone, from Germany, play electronic space, this time being more in the ambient realm. Good stuff though. In summary, an outstanding set and highly recommended if you're looking for a sampling of artists from one of the most exciting genres in music history. But hey... that's a big part of what we cover here in AI!!! Krautrock Karnival is available from http://www.krautrocknet.com, which is also an EXCELLENT resource for all things Krautrock. Contact via snail mail c/o Krautrocknet.com; 31 Looe Road; St Davids; Exeter; Devon; EX4 4BW; UK.